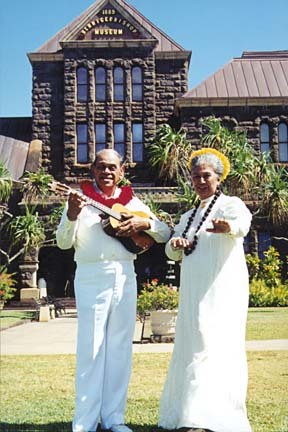 Kahauanu Lake, pictured here performing with Momi Kepilino at Bishop Museum in 1999, is the namesake of the traditionalist Kahauanu Lake Singers. Kahauanu Lake sums up his place in the evolution of modern Hawaiian music simply, saying, "I'm just an average guy." A gentleman doesn't brag about his lineage or his accomplishments, but he's no "average guy." 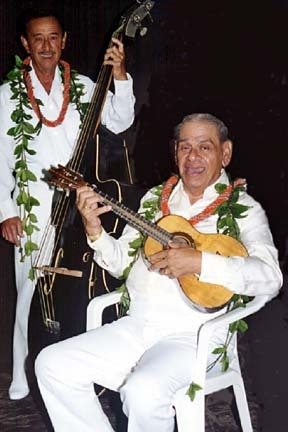 Lake's namesake trio reigned as one of Waikiki's foremost Hawaiian groups for three decades. As a musician, he took the lead in bringing the baritone ukulele into the Hawaiian music mainstream by playing a custom-made instrument designed with a low bridge and thick back. He elevated the basic technique of strumming to an art form while also demonstrating the importance of going beyond simple chords. He bucked tradition with arrangements in which the ukulele defined the melody rather than the rhythm of a song, helping the humble uke make the leap to lead instrument rather than a sidekick to the guitar or piano. The Kahauanu Lake Trio first recorded in 1964. Their albums have become standards and are selling as well now on CD as they did back in the days of vinyl. Lake is also a two-time Hoku Award-winning liner notes writer and received the Hawaii Academy of Recording Arts Lifetime Achievement Award in 1995. 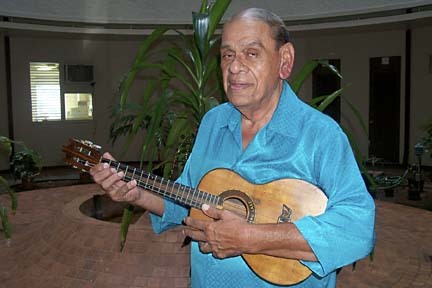 He is currently the namesake and mentor of the staunchly traditionalist Kahauanu Lake Singers, and is the heart and soul of the Hawaiian Music Hall of Fame and Museum. 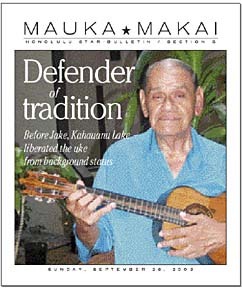 And, on top of all that, as a revered elder and cultural resource, and as the widower of the equally revered kumu hula Maiki Aiu Lake, Lake -- generally referred to respectfully as "Mr. K" or "Uncle K" -- knows everybody who matters in Hawaiian music, and everybody who matters in Hawaiian music knows him. "Other than the recordings (the Kahauanu Lake Trio) put together for this many years, and some of the songs that I've composed for the alii, I'm just a regular joe, as far as I'm concerned, contributing wherever I can to the Hawaiian music scene," Lake said, elaborating slightly on his initial assessment. I'D STOPPED BY to talk to Lake about the recent re-release of "Hapa Haole Hulas," a vintage K-Lake Trio album, and the concert he's playing at the Hawaii Theatre this afternoon with his brother, Tommy, the K-Lake Singers and the Kamehameha Alumni Glee Club. "For the year 2003, the (Kamehameha) school is the recipient of the Hawaiian Music Hall of Fame award, and the Glee Club represents the school," he explained. The show is being co-sponsored by the Hawaiian Music Hall of Fame and the Hawaii Arts Ensemble, and is the annual huliau concert of kumu hula Michael Pili Pang and Halau Hula Ka No'eau. "Michael Pang, who is presenting (today's) program ... was a protégé of Maiki, and so I've known him since he was in high school at Saint Louis, maybe 30 years," Lake said. That the kumu hula who's presenting the show is one of his late wife's protégés isn't unusual, but provides an example of the interconnectedness that is an important part of Hawaiian music and hula as it is passed from one generation of performers to the next. It's when the links between generations are broken that problems occur and priceless knowledge is lost. To mispronounce the lyrics of a Hawaiian song is disrespectful even though Hawaiians no longer believe that mispronounced words can cause literal harm to the performer or their audience. Lake, 71, says he was fortunate to grow up at a time when many of the great Hawaiian lyricists were still available to answer questions. "I grew up in their shadow, so we were very friendly, and when I had questions -- 'Auntie, what's that lyric?' -- I could ask. Working with (Mary) Kawena Pukui was probably the greatest (experience) of my life. Maddy Lam was another great composer. How can you go wrong (working) with people like that around?" Kahauanu Lake and his brother, Tommy, will play at the Hawaii Theatre today. Lake grew up at a time when educated Hawaiians were taught that they needed to "learn haole" if they wanted to amount to anything in a society dominated by "American" values. He graduated from Saint Louis, then attended a mainland college. He formed the Kahauanu Lake Trio in 1955. "If you didn't speak fluent Hawaiian (in those days), you could call somebody who did and they would teach you. 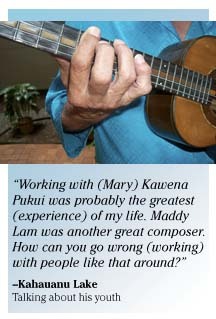 Maiki and I were very fortunate because we had Kawena Pukui and (Alice) Namakelua and all those old-timers. The young people today don't have the old-timers to help them put things together to make (the songs) feel Hawaiian." He added: "I have to give them credit for learning Hawaiian, but the old Hawaiian is different from the new Hawaiian. I go by what Kawena Pukui said and lean that way." CORRECT USAGE of the language is one of things Lake considers non-negotiable. He served as a member of the Board of Governors of the Hawaii Academy of Recording Arts in the early 1990s and ended HARA's long-standing policy of allowing people who didn't speak Hawaiian to determine the winner of the Hoku Award for best use of the Hawaiian language in a new Hawaiian chant or song. Restricting the vote to Hawaiian speakers seemed like a no-brainer -- especially because the techniques used in writing poetic Hawaiian are more complicated and arcane than simply writing lines that rhyme -- but there was tremendous resistance to Lake's proposal. He eventually made it known that he would resign from the board if the old policy continued. Lake won, but decided his energies would be better spent elsewhere and did not run for re-election. From that point forward, he has devoted his time to the survival and expansion of the Hawaiian Music Hall of Fame and Museum. Uncle K does what he can to cultivate awareness of traditional Hawaiian music and the importance of using the language properly. The organization's mission statement is twofold -- to honor great performers and composers of the past, while encouraging new generations to perpetuate traditional Hawaiian music. The monarchs Kalakaua, Lili'uokalani, Likelike and Leleiohoku are honored as the royal patrons of the organization. "Kalakaua, Lili'u and the royal family had a lot to do with (19th-century) Hawaiian music, and the adaptation of European classical music into Hawaiian music that is on a par to any in the world. Young people today need to know what Hawaiians were doing then," Lake said, adding that although "not everything since then is downhill," it's important that this legacy not be forgotten. An impressive list of significant 19th- and 20th-century composers and performers have been inducted into the Hall of Fame since 1995. Two organizations (the Haili Church Choir and Kamehameha Schools), five "famous songs" and five pre-contact chanters have also been inducted as of this year. Lake's performances in recent years have been made on behalf of the Hall of Fame, but he admits to having been taken by surprise when the group's advisory board secretly voted to make him one of the two inductees for 2004. "I called Nina (Keali'iwahamana) and told her (the committee) needed to schedule a meeting (to consider possible inductees), and she told me it wouldn't be necessary because they'd already selected the person they were going to present the award to. I said, 'Who would that be?' and she said 'You!' -- ha ha," Lake said wryly. Lake and Kawaiaha'o Church will be formally inducted with a free concert in the church on Feb. 29, 2004. "Kawaiaha'o Church was where (modern Hawaiian music) began, really. The first songs that Hawaiians learned were the himeni (hymns) at Kawaiaha'o," Lake said. "Kawaiaha'o was also the church of Queen Lili'uokalani." The queen directed the church choir and shared organist duties with Heinrich "Henry" Berger (no relation to this writer). "The important thing was to get the (three) organizations in -- the choir, the church and Kamehameha Schools. Now we can go after the other composers and (more recent) people." In addition to supporting the Hall of Fame, Lake continues to do what he can to shore up awareness of traditional Hawaiian music and the importance of using the language properly. "A lot of people have no place to learn about Hawaiian music," he said. "The kupuna are gone. Who can you ask? Even some of the people who are doing 'Hawaiian music' are leaving the 'Hawaiian' out of it."